Our 50 wine-strong Retrospective of the 1998 vintage underlined the all-round beauty of this slightly under-rated vintage. The wines are simply delicious. Mosel Riesling blossoms as it matures. Every year, we dedicate the Spring Issue of Mosel Fine Wines to the beauty of mature Mosel. 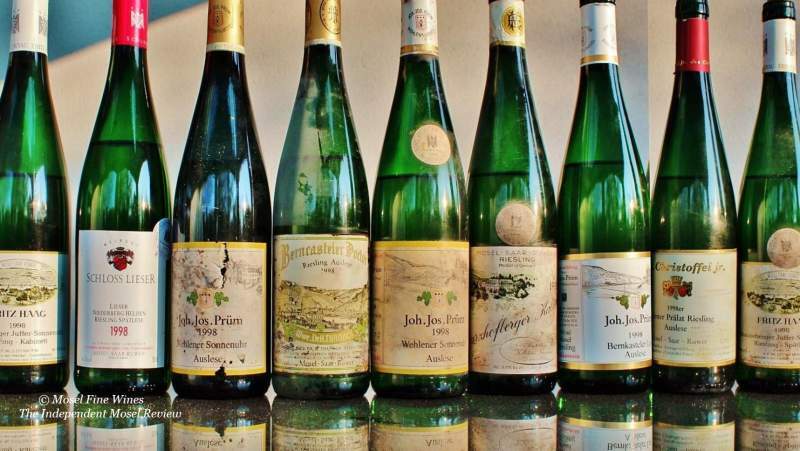 This includes the largest "20-Years-After" Riesling retrospectives made anywhere in the world. After the perfect 1997 vintage last year, we took on the slightly more difficult 1998 vintage this year. The start of the season proved quite ideal, with perfect flowering just ahead of long-term averages. The summer was marked by an unusually hot and dry August, which led to heat damage and loss of yields. A poor and rainy autumn delayed harvest until late in October. But the vintage redeemed itself by providing growers with some early Eiswein. Despite the worries due to the difficult harvest period, the wines were well-received thanks to their open and forthcoming nature. The vintage catered the basic needs for Estate wines and Kabinett. On top, it offered the chance to stock up on some stunning Eiswein. We re-sampled over 90 wines from from leading growers including Geltz-Zilliken, Fritz Haag, Schloss Lieser, Egon Müller / Le Gallais, Joh. Jos. Prüm, von Schubert, etc. The retrospective underlined the beauty of the vintage: The 1998 wines are simply delicious! They are juicy and animating and deliver good aromatic presence while remaining on the playful side. The sweet spot of the vintage are the Kabinett and the Eiswein, i.e. at both ends of the must scale. All parts of the Mosel delivered handsomely, making it a nice all-rounder to cater for many needs. Overall, there is much to enjoy in the 1998 vintage, even if it does not reach the dizzying heights of its predecessor. The complete 1998 Riesling Retrospective including our list of highlights and detailed tasting notes for each wine was published in Mosel Fine Wines Issue No 40 (Apr 2018).